There are no certainties in the investment universe. Investors are forced to weigh up the various risks and assess the probabilities involved before committing themselves to a course of action. 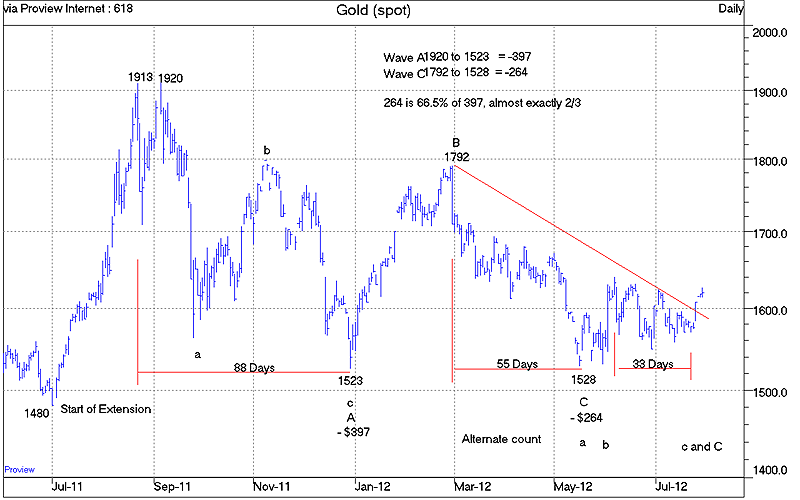 Current Elliott Wave and technical studies suggest that the probabilities now favor a strong rise in the gold price. It may be helpful to consider my personal assessment of the various probabilities at different points in the recent gold market correction. 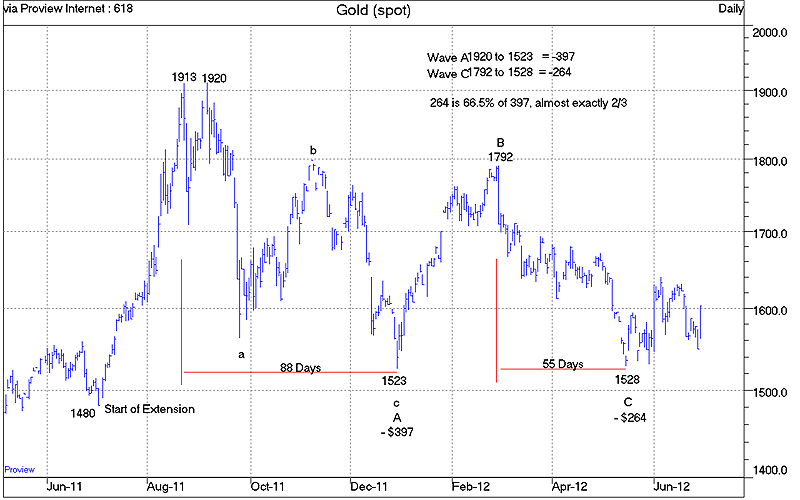 On 23 August 2011 when gold pushed above $1910 my guess was that there was a 90% probability of a severe correction. The target for the decline, as given in my keynote speech at the Sydney Gold Symposium in November, was circa $1480, the point at which the explosive extension in the gold price had started. Extensions have a good record of retracing to the approximate point from which the extension began, in this case $1480. Market action during the decline is used to fine tune a more accurate end of the correction. Gold never got down to target of $1480, stopping not very far away at $1523 in late December 2011. At $1523 all the minor subdivisions suggested that there was a 75% probability that this was the low and that the market would move into a strong upward move, probably the most vigorous of the bull market. A lesser alternative considered was that $1523 might only be the A wave of a larger A-B-C correction. Subsequent events proved that the lesser alternative - that $1523 was only the low point of the A wave - proved to be the correct diagnosis. The A-B-C correction is shown in the above chart. The upward move from $1523 through January and February 2012 to $1792, a gain of $270 in just 2 months, looked exactly like the vigorous upward move that had been anticipated. From $1792 a correction in the 6%-8% range was expected. That meant a maximum retracement to $1650 could be tolerated. A decline below $1650 would indicate that something was wrong with the analysis and would necessitate examining alternative possibilities. Gold did drop below $1650, throwing a spanner in the works of the expectation that the market was in the early stages of the massive third of a third wave with a target of $4500. Once the 61.8% retracement level at $1626 was also broken, the strongest probability was that the rise to $1792 was the B wave and that the market was declining in the C wave. At this stage it began to look as if gold might still achieve the original downside objective of $1480. The decline halted at $1528 and then started rising in a desultory fashion. The above chart was produced at that time showing that the A wave decline had lasted 88 trading days while the C wave decline had lasted 55 days. In addition the C wave decline of $264 was 66.5% of the A wave decline of $397, as depicted on the chart. The 2/3 relationship between the A and C wave declines plus the ratio of 88 days to 55 days absorbed by the respective waves, a neat 8:5 Fibonacci ratio, improved the odds that $1528 was the end of wave C. It would thus also mark the final end of the correction that had lasted since late August 2011. The above positive assessment was not published at the time. Additional confirmation from further market action was required to be sure of the call. The required evidence of a rapid and large upward surge in the gold price plus the break of the prominent downtrend did not emerge. Gold simply churned within a relatively narrow range below the declining trend line. A number of readers have urged me to pay more attention to time. In the past I had found that the magnitude of the waves was a much more important factor than the time involved. I had never been able to make an accurate call using only time elements and cycles. Every time I made a forecast based on time, I got it wrong. Nevertheless, I resolved to examine the time elapsed by the different moves more closely. That gave rise to recognizing that the 88 and 55 days absorbed by the A and C wave declines respectively was the interesting Fibonacci ratio of 8:5. With the gold market churning and going nowhere, I developed an alternative theory that $1528 was not the final low point of wave C but only the low point of wave a of an a-b-c move making up the C wave. That would explain the desultory sideways trading in the gold price and implied that the final low was still somewhere in the future. An extension of this theory was that the decline in the smaller and final wave c to the low would last 33 trading days. This would extend the previous 88:55 ratio to 88:55:33, and would mean that the time absorbed by the two small c wave declines would total 88 days (55 +33), identical to the 88 days absorbed by the wave A decline. This was pure hypothesis. There was no real basis for this theory, but it seemed worth testing it. If it was possible to predict the day of the final low ahead of time, that would be a significant achievement. Gold had rallied to $1640 on 6 June 2012 and then started churning sideways with a downward trend. Projecting ahead 33 trading days from 6 June 2012 produced a date for the forthcoming low of 23 July 2012. I didn't have any idea of what the low price would be. The chart below depicts what happened on 23 July 2012. The low gold price on 23 July 2012 was $1564, certainly not a new low. Yet the gold price started rising almost immediately. Within a couple of days the gold price had broken upwards through the downtrend line that had been in place since the end of February 2012. This is a very positive development which will be greatly enhanced if the gold price continues to move strongly upwards over the coming days and weeks. The bottom line is that we now have a really strong probability that the correction which started at $1913 on 23 August 2011 has been completed both in terms of Elliott waves and also in terms of time elapsed. If this is correct, the gold price should soon be expressing itself in violent upside action as it moves into the third of third wave which is still targeted to reach $4500.